A schematic of the new precision-guided sterile insect technique (pgSIT), which uses components of the CRISPR/Cas9 system to disrupt key genes that control female viability and male fertility, resulting in sterile male progeny. A description of the new “precision-guided sterile insect technique,” or pgSIT, is published Jan. 8 in the journal Nature Communications. 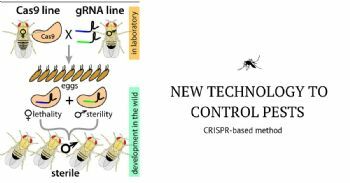 The new technology is distinct from continuously self-propagating “gene drive” systems that propagate genetic alterations from generation to generation. Instead, pgSIT is considered a “dead end” since male sterility effectively closes the door on future generations. “The extension of this work to other insect pests could prove to be a general and very useful strategy to deal with many vector-borne diseases that plague humanity and wreak havoc an agriculture globally,” said Suresh Subramani, global director of the Tata Institute for Genetics and Society.